Toronto has a flourishing restaurant and hospitality sector. Food is a center point that brings us all together. The growing industry opens the door for many restaurants to offer specialized and varied culinary experiences. To entice patrons to visit your establishment and return as a repeat customer, a fresh and captivating marketing approach is mandatory, which includes an engaging online presence and effective messaging. Thinkbound Marketing Solutions, a Toronto restaurant marketing company, is dedicated to walking restaurant owners through each step of branding their establishment for long term success. Each day, a bevy of new restaurants open in Toronto which ignite a competition to attract customers. Having an online presence that embodies the essence of your uniqueness and offerings is what you need to attract patrons to your restaurant. Having a website will bring your brand to the widest possible range of customers while also implementing tools that can improve overall operations through online reservation booking tools, catering request forms, interactive menus, photo galleries and live real time updating social media feeds such from Instagram and Facebook channels. A website designed with these tools will enhance your virtual invitation to the masses. Have a look at Miller Tavern – just one of our clients’ effective use of these booking tools and social media feeds to make an impact. Whether you are creating a new venue or refreshing an existing establishment, it must be able to generate foot traffic as well as provide easy to understand menus and make reservations. A well designed layout is the engine that will drive new and repeat customers to your restaurant. Thinkbound Marketing Solutions offers conceptual menu design and marketing material that targets your unique demographics. We have the expertise to offer clients specialized and innovative services from menu design, exterior storefront design, in-store displays, online ordering system integrations, strategic messaging and branding and online search optimization. Our dedicated team will work personally with you to strategically build out your advertising strategy. 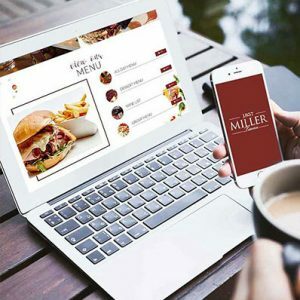 Whether it is a website design, such as Miller Tavern or redesigning menus for individual storefronts or franchises; or large format printing and exterior restaurant display; we offer a tailored and comprehensive restaurant marketing strategy aimed to target your unique needs and budgetary requirements . No matter the size of your business, our team of talented professionals treat each and every project with integrity and with direct personal support. Once you have your initial design brought into realization, you need a partner that will continually maintain your website and branding and offer continuous marketing and IT support. This is paramount for you to focus on your core specialties while we keep abreast of fresh new trends and leading-edge design formats. We offer you this peace of mind as we are your partners to ongoing, effective marketing that will impact. Call Thinkbound Marketing Solutions today at 1-800-564-7483 for all your Toronto restaurant marketing needs. Your objective is to attract customers and a partnership with Thinkbound Marketing Solutions is an excellent choice for success. I am the gm at a bar and grill on queen st. West, toronto, and we are looking for a marketing agency to help expand our visability and customer base. Id love to get more info on how we can partner to do this. Thanks for your message Sara! We’ll be in touch!